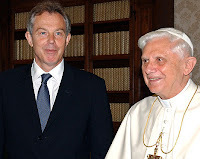 Tony Blair has discussed becoming a Roman Catholic deacon when he quits office. The revelation comes as he prepares to meet the Pope amid speculation that he will use the audience in the Vatican to announce his conversion. In his last foreign engagement, just days before he leaves Downing Street for the final time, the Prime Minister will visit Pope Benedict XVI in what officials say will be a "highly significant" personal mission. USA Today: Are There Really 69 Million Catholics? "A Life Completely Oriented Toward Christ"
Where is the Outrage from the Media? Does Watching TV Damage Character? Visions of Mary in South Africa?